But, even after hearing such biased push questions culminating in the one above designed to tarnish Rep. Nunes, the incumbent still pulls a 46-43 percent lead within the polling sample. For his part, the eight-term congressman is ready for a competitive campaign. Raising over $4.9 million for his 2018 re-election campaign and holding over $5 million in his campaign account, Rep. Nunes possessed financial resources greater than any other congressional candidate at the time of the California pre-primary disclosure report deadline (May 16). President Trump carried the 22nd District, one of the safest Republican seats in this heavily Democratic state, 52-43 percent, down a net six points from Mitt Romney’s 57-42 percent performance in 2012. Though the district voter registration figures favor Republicans by 10 percentage points, the PPP polling sample gave them only a net seven-point advantage. On the other hand, the Hispanic sample was 13 points below the citizen voting age population demographic figure for the Central Valley district. 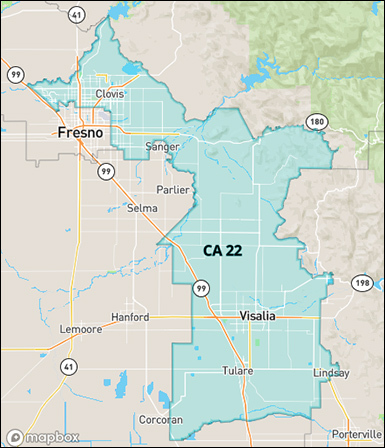 The 22nd District contains parts of Fresno and Tulare Counties. The northern boundary captures the eastern residential part of the city of Fresno, including the adjacent city of Clovis, before continuing southeast to annex the cities of Visalia and Tulare.